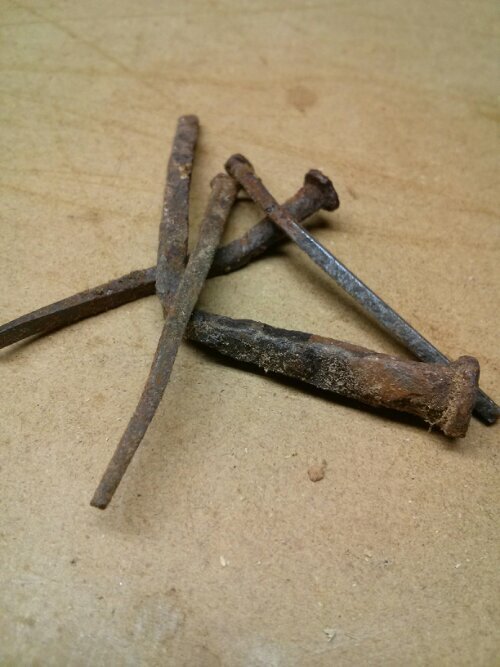 We’ve got this 2.5-quart bucket full of rusty old nails that were pulled out of the wood we turned into our dining room table, shelf, and photo shelves. I’ve thought about using them for a crafty DIY project but I haven’t really figured out what to do. They can’t be re-used strictly as nails, so I figure they’ve got to be incorporated into something else. My ideas are to pour some clear plastic or epoxy over them and into some type of mold to make coasters or trivets or build them into a picture frame. What are your thoughts? Any ideas on what I should do? Should I clean them up or leave them rusty? Maybe use the nails with a nice piece of lacquered, rustic looking (but smooth) wood to make a “what in the hell should we eat tonight?” plinko board. In each space on the bottom where the coin falls, put a food genre/protein/starch/veggie/dessert (ex: Italian/Shrimp/Broccoli/Fruit). If you ever get stumped with an apathetic appetite, drop a coin! The same can be made for your crossfit workouts (jog, burpees, etc). That way your pain is up to Newton. OR you can use the crooked ones to make some awesome wall key ring holders.